King is an American former World No. 1 professional tennis player. King won 39 Grand Slam titles: 12 in singles, 16 in women's doubles, and 11 in mixed doubles. She won the singles title at the inaugural WTA Tour Championships. She often represented the United States in the Federation Cup and the Wightman Cup. She was a member of the victorious United States team in seven Federation Cups and nine Wightman Cups. For three years, she was the United States' captain in the Federation Cup. 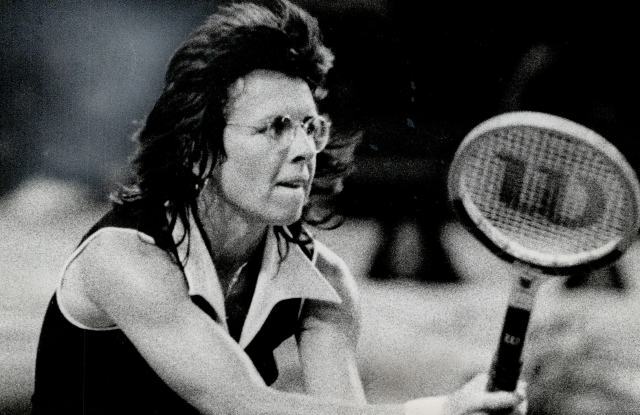 According to John McEnroe, King has been "the single biggest influence in the history of women's sports." That statement, and King's "not done yet" statement, were featured in an article that appeared in the March 22, 2019, edition of The San Francisco Chronicle. The Chronicle's paywall can be formidible, so if the link ends up in frustration, for those who might want to follow it, let me cut to the chase, and tell you why I am featuring Billie Jean King in my blog posting for today. In the course of her conversation with Jennifer Azzi, a gold-medal winning basketball player, King said "Everyone is an influencer." That is the quote that caught my eye. King was talking about her influence on sports, and on securing the position of women in sports. In fact, the observation is one of general application. King got it right: "Our words are so powerful," she said. "Everyone is an influencer." That is true in the political realm, too. That's why our freedom to speak out is guaranteed against government interference in the very FIRST Amendment to the Constitution. I take King's statement as an invitation to speak out on the political challenges we face, and on the opportunities that we can realize, if we mobilize together. That means me. That means you!